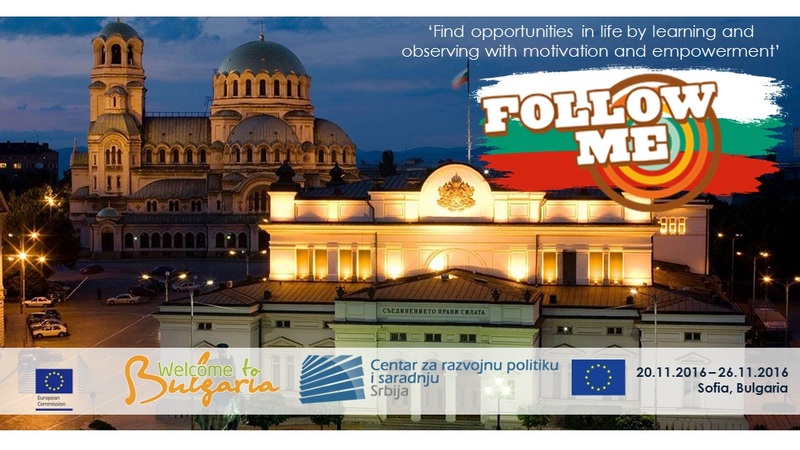 Centar za razvojnu politiku i saradnju (CRPS) ima zadovoljstvo da vas pozove da se prijavite na konkurs za trening kurs “Follow me – Find opportunities in life by learning and observing with motivation and empowerment” koji će se održati u Sofiju u Bugarskoj od 20. do 28. novembra 2016. godine. Pravo prijavljivanja i učešća imaju svi mladi iz Srbije starosti od 18 do 27 godina. Prijavljivanje se vrši popunjavanjem aplikacione forme (ispod), za više informacija pišite isključivo na mail konkurs@crps.org.rs sa nazivom mail-a “BUGARSKA”. Opciono planirana je trodnevna poseta Istanbulu. 29.-10.09.2016 (23:59) – Rok za prijave. 10- 20.09.2016 – Kontaktiranje odabranih učesnika. 20.09.2016 – Rok za uplatu participacije (u iznosu od € 20) za odabrane učesnike. 25.09.2016 – Predstavljanje programa i potpisivanje ugovora o učešću. ‘Follow me’ is a training course for youth workers, youth leaders, EVS mentors on how to use coaching techniques for empowerment of people in non-formal learning activities. During the course the participants will learn how to use the coaching methodology, tools, techniques and best practices to develop competences and qualities of people to realize their full potential and personal values and to find their personal motivation to set and achieve their goals. During the training all the participants will develop their soft-skills like active listening, powerful questioning, direct communication, creating awareness, designing actions, planning and goal setting, managing progress and accountability and etc. The general objective of the ’Follow me’ training is to train and empower educators (youth workers, youth leaders, EVS mentors, etc.) in using coaching techniques and competences in their work (grassroots youth work, youth exchanges, EVS framework, etc.) with the target groups (young people and disadvantaged, those with fewer opportunities, from remote geographical areas and refugees, who need professional intervention and assistance in integration, development, integration into society, their adaptation and increasing tolerance and jointly respect). As a result of using coaching techniques in the youth work the target group will achieve personal satisfaction, will find its place in society and will be more motivated to achieve its own goals, to find its personal balance and to develop on personal and professional level. The project aims to strengthen the international cooperation between program and partner countries, which determines the current choice of partners. In the project will take part participants from Albania, Bulgaria, FUROM, Georgia, Greece, Italy, Jordan, Lithuania, Portugal, Romania, Serbia, Spain and Turkey. Each partner has extensive experience in exchange programs, trainings and organization of informative, cultural, sports, volunteer and interactive events. The training course includes several specific stages. The first stage focuses on establishing trust and coaching agreement with the target group. The second one is focused on the discovery process – on finding and setting goals, values, ambitions, vision, dreams and others by using the coaching methodology and improving skills like active listening, powerful questioning, direct communication and creating awareness. The third stage is about giving feedback – a process that occurs between the coach and the coachee. The fourth focuses on results – designing actions, planning and goal setting, managing progress and accountability – competences needed for achieving self-awareness in the individual.